A little over twenty years ago, in response to a part-time job advertisement, I walked across the campus of Northwestern University from the TA offices of the English Department to the Searle Center for Teaching Excellence. I met there with Ken Bain, the Center's director, and learned about the work that the Center did in supporting teaching and learning at Northwestern. Ken was great, the hours worked with my schedule, and--with a baby at a home--we needed the money. At that time I had a few years of teaching under my belt, both as instructor of record and as a teaching assistant, but I had no special interest in teaching. That all changed when Ken was generous enough to allow me to spend some of my time at the Center becoming acquainted with its library of research, both books and articles, on teaching in higher education. Through those books, and through the many conversations I had with Ken over the next few years, I became fascinated by the scholarly approach that Ken took toward two challenging questions: How do you help another human being learn? And how does our answer to that question translate into the messy context of a college classroom? My part-time job led me eventually to accept a position as assistant director of the center, where I continued to work with and learn from Ken for three years before I left for a tenure-track position in my field. But those years at the center created in me an enduring curiosity about teaching, and a recognition that the scholarly project of trying to understand how to teach effectively at the college level holds enough fascination for a lifetime. 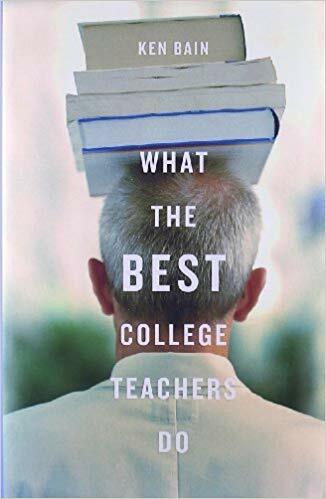 Ken's work has remained a lodestone for me for the past twenty years, especially his seminal book What the Best College Teachers Do. It thus gives me immense pleasure each summer to reconnect with Ken, and experience anew his ideas and approach to teaching and learning in higher education, at the Best Teachers Summer Institute. This year's Institute, which I now have the pleasure of helping to organize, along with Mindy Maris, will take place in West Orange, New Jersey from June 18-20th. You are cordially invited. Each year we make improvements to the program, and this promises to be our most exciting year yet. In addition to the usual mind-blowing sessions with Ken, and supporting sessions from Mindy and me, the 2019 program will feature two sessions from Eric Mazur, one on peer teaching and one on the power of altruism to motivate students; and a session from Kathy Takayama on diversity and inclusion in higher education. By the end of your three days with us, you will have reconnected with your passion for your discipline, taken a deep dive into the literature on teaching and learning in higher education, reviewed your teaching philosophy and practice from the ground up, and met lots of new friends with whom to share ideas. We hope you'll join us, and we look forward to talking teaching with you this summer.